As a food blogger boy can I say that the holidays are approaching fast. It is time to start thinking about great times spent with family and friends. Those my friends are the memories that you will hold closest to your heart. 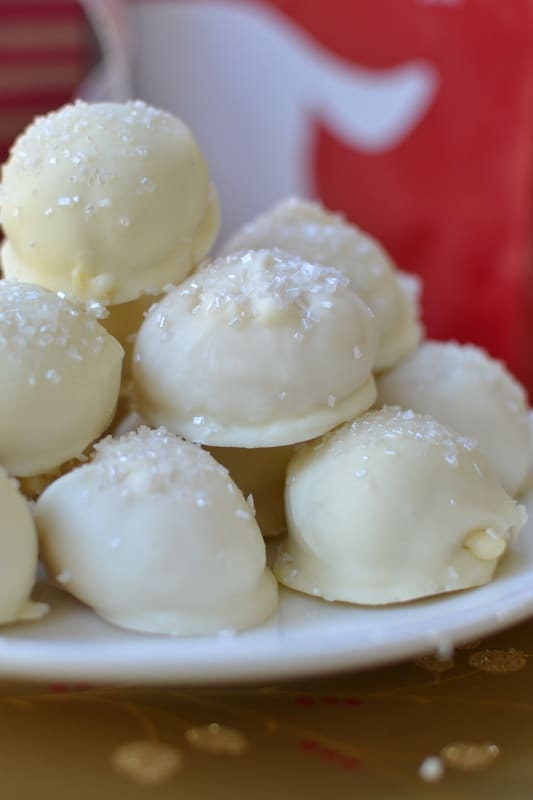 These delicious Party Worthy Eggnog Truffles are just that. They will make the most out of your holiday get together, office party, neighborhood soiree or cocktail party. They are simply amazing. 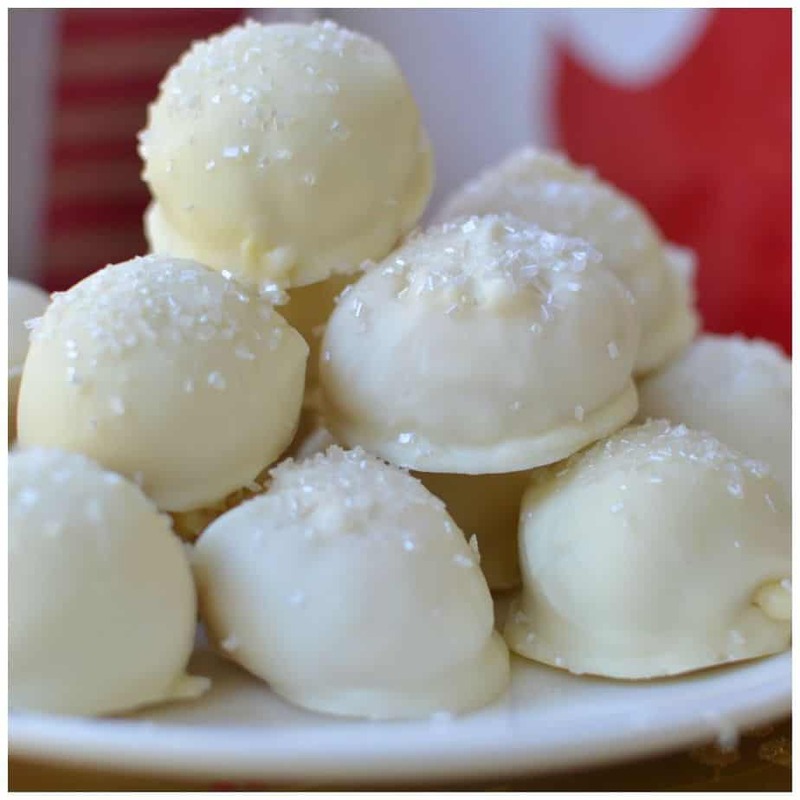 These scrumptious Party Worthy Eggnog Truffles are so delectable that your guests will be asking for the recipe and skipping around all the other party desserts. Do you love eggnog? Have you tried my Eggnog French Toast? Do you love truffles? Have you tried my Strawberry Cream Truffles? Looking for more awesome eggnog recipes? Eggnog Cheesecake and Eggnog Fudge are family party favorites brought to you by my friend and awesome blogger Baking Beauty! 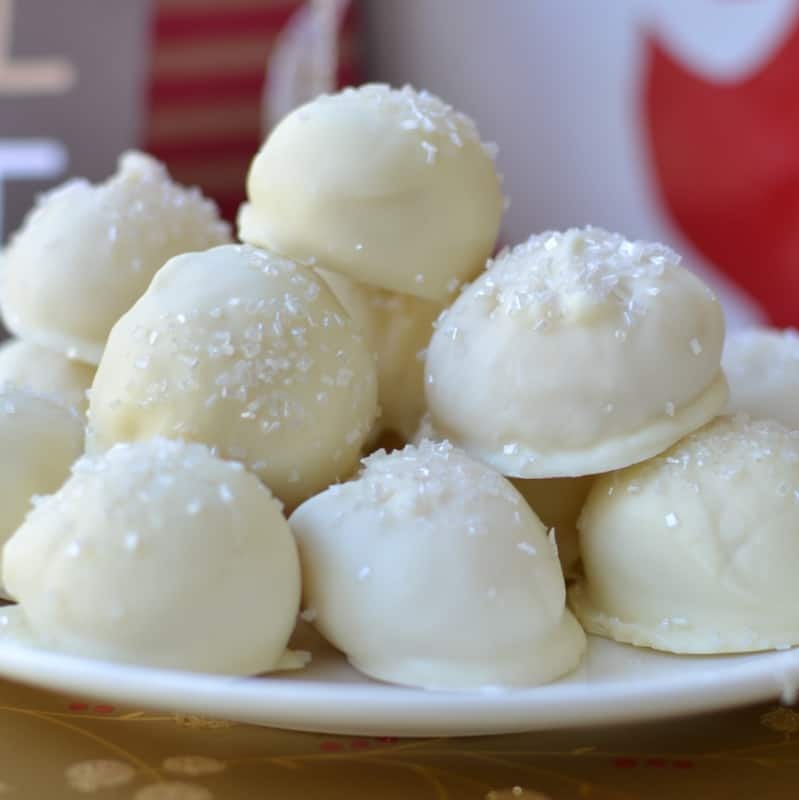 These Party Worthy Eggnog Truffles are amazing. They are worth all the effort and then some. 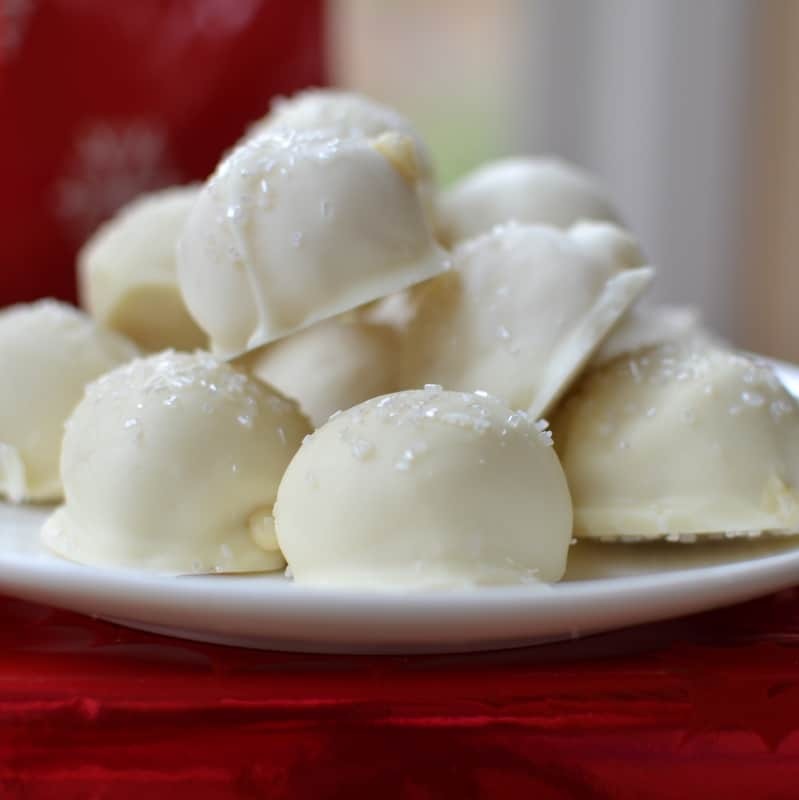 There are a few tips I have for you for making these truffles. Cover and refrigerate the ganache overnight. Cover your hands in a light dusting of powdered sugar to roll the ganache into balls and place on parchment covered baking sheets. Place the rolled balls on a parchment covered baking sheets in the freezer for flash freezing for approximately 45 minutes. Be patient when it comes to chilling them and roll again right before dipping. 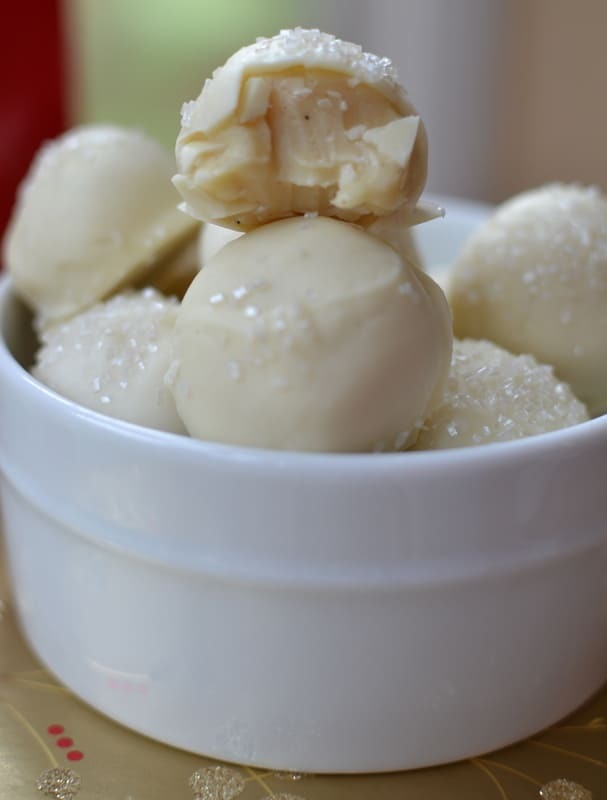 Keep the truffles in the freezer as you work with with them. It will help to keep them chilled and round. Dip in the warm ganache using fork and turn to cover, place on cookie sheet covered with wax paper, allowing truffle to slide off fork. Sprinkle before set with White Shimmer Sugar. These beauties are so luscious! I know you and your family and friends will absolutely love them. 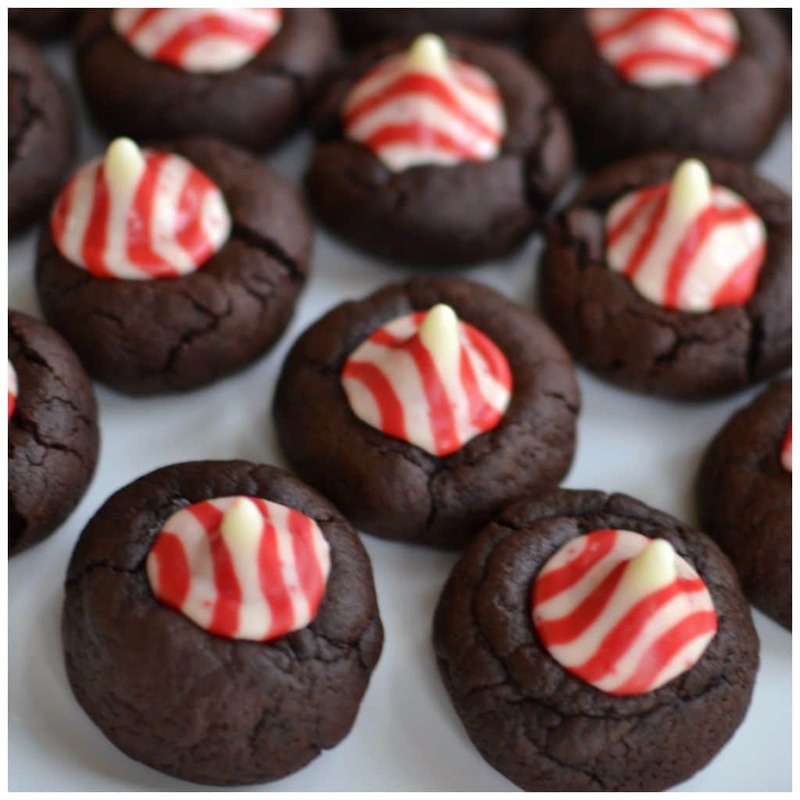 You can place these gorgeous treats in pretty candy cups for gift giving or your holiday party!! In saucepan over low heat combine butter, eggnog, vanilla extract and nutmeg.. Stirring constantly cook until butter is melted and it is hot enough to melt the chocolate; approximately 4 minutes. Add 2 cups chocolate chips and continue stirring until the chips are completely melted. Remove from heat and stir in rum. Allow to cool to room temperature. Cover and refrigerate for several hours to overnight. Cover cookie sheet with parchment paper. Dust hands with powdered sugar and working quickly use a small spoon to shape ganache into balls and place on parchment paper. Place in freezer for 45 minutes. Divide remaining chocolate in half and place in small microwavable bowl. Microwave for 1 minute at 50% power. Remove from microwave and stir. Repeat for another minute at 50% power and stir again. If needed cook for 30 more seconds at 50% power Be sure and stir completely as the warmth of the bowl melts the chocolate. Stir one teaspoon of cooking oil in while you are stirring to melt the chocolate. Remove truffles one at a time from the freezer and roll gently in melted chocolate using a fork. 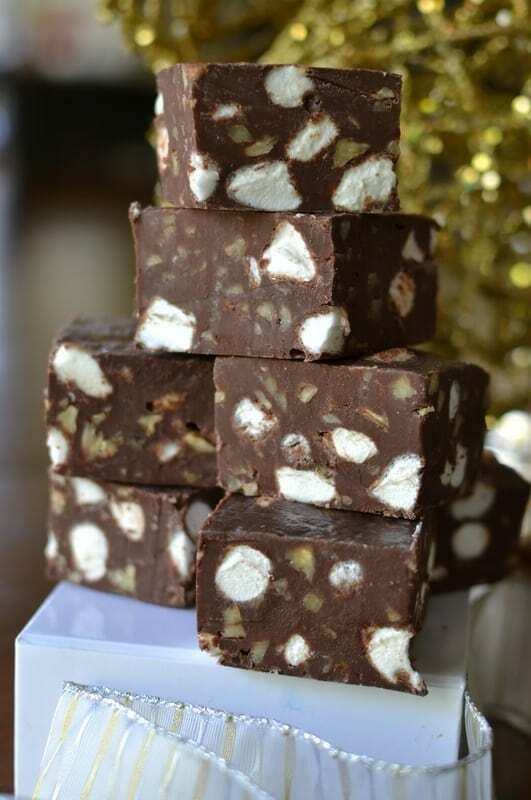 Lift gently out of the chocolate and place on wax paper letting them gently roll off the fork. Sprinkle with white shimmer sugar. Repeat with half of the ganache balls from the freezer. Repeat the melting process with the other half of the chocolate and coat the other half of the ganache balls from the freezer. 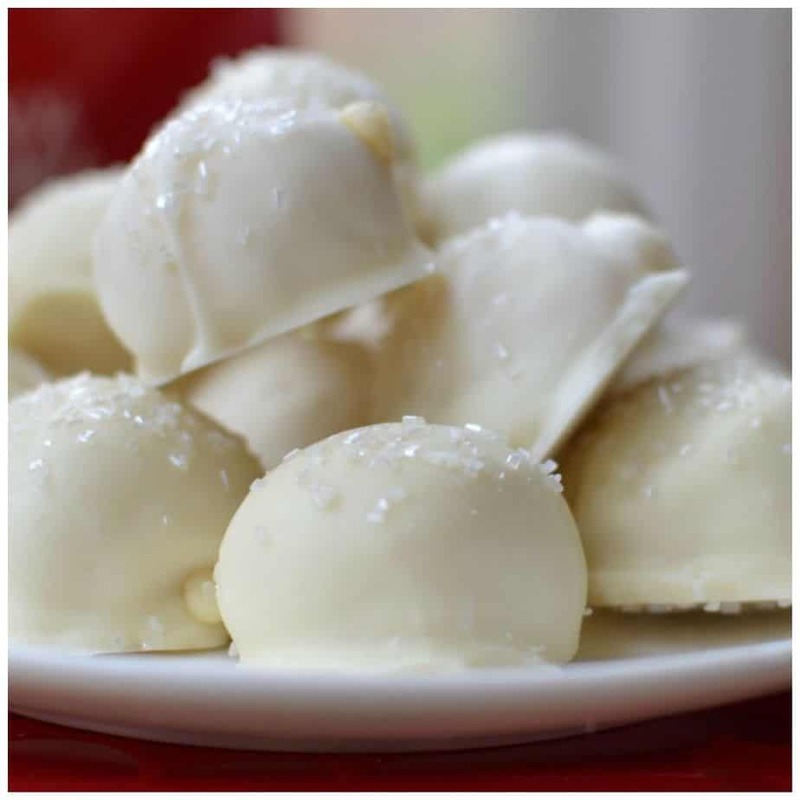 Sprinkle with white shimmer sugar before the chocolate starts to set. Cool completely in refrigerator. Store in refrigerator in airtight containers. Other sweet recipes you will love! Hello, I’d Love to make these for my friends nur am not familiar with American weights. How much grams is one cup? Do they have to be stores in refrigerator? Yes they need to be refrigerated. do you think i could use advocaat in place of the egg nog? I am not sure what that is. Can you please try to explain?